Saints quarterback Drew Brees and Eagles quarterback Carson Wentz. After losing to the Cowboys at home in Week 10, the 4-5 Eagles are in desperate need of a win on Sunday. Unfortunately, they have to go on the road to face the red-hot New Orleans Saints. This game feels like an easy call, so we won't bother diving too deep. The Saints have the most efficient passing offense in the NFL behind MVP candidate Drew Brees, to go along with a very good rushing attack. The Eagles, meanwhile, will likely be missing three starters in their secondary, including both outside corners. This game marks the first time the Eagles will be underdogs all season long, sooooooooo, break out the dog masks? I don't think that'll help this year. I have been racking my brain trying to think up a scenario where the Eagles beat the Saints to get back to .500 and there really is only one: Carson Wentz has the best game of his life. It might require 400 yards and five touchdown passes, but the Eagles need to more or less reproduce their Super Bowl performance by scoring on every possession to make up for what will likely be an ugly showing for the Birds' defense against the high-powered Saints, who are led by MVP front-runner Drew Brees. Their offense is reinforced by a pair of mostly unstoppable running backs in Mark Ingram and Alvin Kamara. The Eagles, meanwhile, have Josh Adams, Wendell Smallwood and a completely unintimidating Corey Clement. It will all fall on the passing game and I don't see the miracle offensive explosion coming this week. I see the Eagles' season on the brink at 4-6 after this game. Like most of the other guys here, I tried to come up with any sort of realistic scenario in which the Eagles come away victorious. But honestly, the only thing I could come up with is this: On the first play of the game, Drew Brees and Alvin Kamara collide on an ill-timed handoff and both suffer concussions that force them to miss the rest of the game. Realistically, the Eagles have to play their best game of the season and hope that the 8-1 Saints suddenly forget they're the hottest team in the NFL. But stranger things have happened. The Eagles like being underdogs — and, boy, are they underdogs this week. Maybe that's what's been missing all season. The Eagles are about as poorly equipped to stop the Saints as any team in the league right now. Their only case for winning is that the NFL is strange and sometimes makes no sense, and that’s not a serious reason to pick a winner. If they hold New Orleans under 50 it should almost be considered a moral victory. This is the best I think we'll see the Eagles play this year, though, regrettably, their best doesn't even scratch the armour of the New Orleans Saints. This is a home game for the Saints, who have the the home-field advantage throughout the playoffs if they stay the course and continue to win. 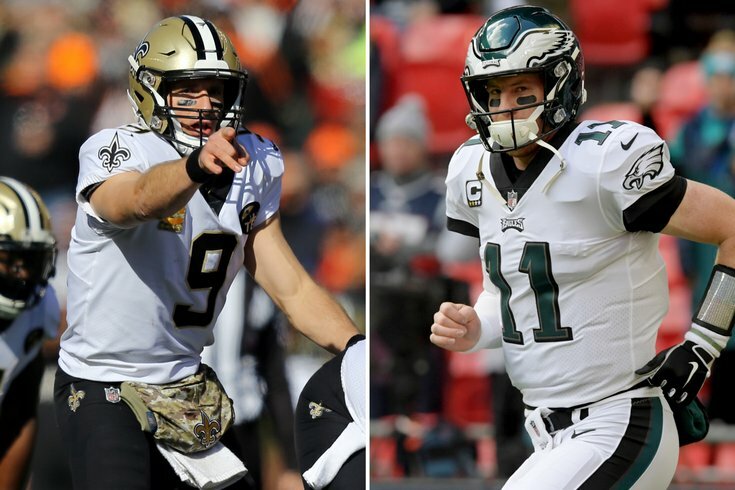 The Saints know that the Eagles are a desperate team playing for their season. This will be a struggle for three quarters, until the Eagles falter in the end, simply because they've run out of pieces to play with.